Some confusion here. Are you saying that Amun must be associated with Mount Sinai ? I don't know how Amun got into the Moon climbing the hill to the gods. But the stars could still be followed easily no matter what the pole was doing. And so the stars would be the best reference, and by associating the stars with the temples and cities of Egypt a map of Egypt could be used to track the planets even if the Earth had picked up a severe wobble. Along with the use of gnomons the ancients could then keep track of the planets and the Earth's movements. The EU Bible - advanced knowledge? does the bible show further or advanced knowledge of EU events/stuff compared to its inspiration eg the other stories/cultures before it? can the stories/events in the bible show the development of ideas and knowledge from previous peoples, perhaps revelations showing advanced knowledge compared to the old testament? I dont suppose any one has studied kabbalah have they and knows what that suggests or says about these stories and ideas? >>are you saying that Amun must be associated with mount Sinai? I will attempt to clarify the situation, although unlike some of my Egyptian work (god king planets), my biblical stuff is far short of set in stone. Amun is to be associated first and foremost with the 'global' aurora. He is also to be coupled with electrical apparitions periodically observed around the astral monarchy. An example; Some pharaohs had the title 'Amun is at the head.' A nonsensical epithet to Egyptologists but in a world dominated by cosmic chaos and god king planets - this is Amun's neon blue lights (Amun's main sacred colour) observed at the head of, in this case, Pharaonic Mars. Cometary bodies probably also had Amun 'attached' to them, but dust may have deemed such phenomena invisible apart from downwind of some larger bodies. I believe earth's plumed magnetotail was also observed (mainly on the horizons) and this too, should be ascribed to Amun. I say this because there exists scant references to Amun as "lord of heaven and of earth, and of the deep, and of the two mountains. " This would explain why he wore exactly 'two' plumes atop his Lower Egypt red crown. When seen to pass overhead during the night, Amun's mountains may had appeared to merge into one, but who knows exactly what was seen. We have to bear in mind Hathor's dusty ring (& other phenomena). If I find references in support of Amun and a single mountain, then I will revaluate this. 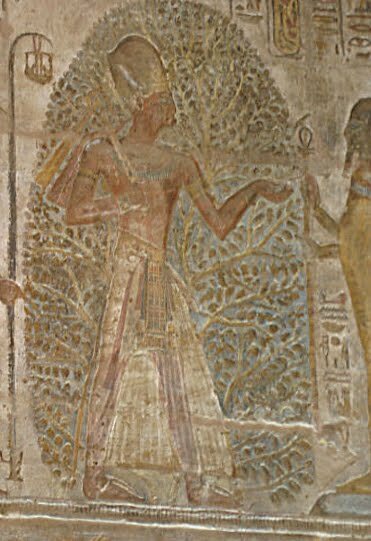 What I don't see (so far) is any tree-like electrical apparitions associated with Amun. Hathor on the other hand did have an association with a tree i.e. she was the 'lady of the sycamore'. This was, in all probability electrical tree-like apparitions seen with earths rings. I do not associate Amun with M Sinai. I think the confusion (here and with past cultures) arises because of later peoples attempting to decipher earlier writings at a time (AD) when the heavens had begun to clear somewhat. We probably still had faint rings and being more defined these appeared as mountains or mountain (mountain of god) This would include mount Sinai, the mountain of the Moon or the celestial mountain the moon (Moses) climbed to have little 'chat' with god. The two tablets could be a 'plumed' moon or perhaps only the tips of Amun's magnetotail were seen (just an idea) and these looked like 'tablets' engraved with the 10 commandments. God in this case is anybody's guess, the bible is corrupt with many bias authors attempting to decipher ancient script, injecting their own ideas as to what 'god' should be. With psalm 104 we can trace god back to Mercury (hymn to the Aten), however, perhaps the god of the exodus can be traced back to Amun. With such bias views we may never know. >>But the stars could still be followed no matter what the pole was doing. I am referring to a pole shift, movements in earth's axis as opposed to a magnetic pole reversal (which I also believed occurred numerous times). If earth's axis shifts, so do the stars albeit on a small scale. There is more than enough evidence to suggest the geological north pole was at some point in the past located around the Hudson Bay area. Probably when Mars/Amunhotep locked into a geosynchronous orbit above the Trans Himalayas, prior to and during its catatrophic electromagnetic birth of Mercury (core of Mars). This, so far (ancient chronology is way out!) I have dated to around the 7 - 8th century B. C. This is the time I believe vast quantities of vaporised fine sand was deposited on earth. Fanning out from the Himalayas in great swaths across Asia and North Africa. Forming the vast deserts we see today. Later temples (as earth's axis settled somewhat) probably tracked the movements of the transposed Egyptians (stars)although the sun, moon, kingly planets and bright stars would undoubtedly come before the background stars. Something I'm still researching. I like to thank yourself and Matt for your positive comments on the TPOD forum, very much appreciated. Matt, who knows how the original story, drawn possibly from both Egyptian and Mesopotamian sources became embellished on. The Moon/Moses may just have wandered the apparent wilderness of above for 40 years but it could just be figure drawn from thin air. With the sacred hieroglyphs and images we have the testimony of the ancients, written during the time of cosmic catastrophe, the 'here and now.' Unlike the bible written decades after the event, we can go back and revaluate the text and images. This along with the sciences is the only way we are going to get a realistic account of what actually occurred some 4,000 years ago. Now a ring around the Earth would have appeared near the horizon at all times of the day and night, whereas the magnetotail would get up high in the sky around midnight. I'm starting to see Amun as a shimmering light no matter where it appeared in the sky. So one would then expect it associated with the magnetotail. By observing when the stars set and rise and noting the star that does not move because the pole is pointing at it, the ancient Egyptians would have been able to keep track of the planets and the motion of the Earth. Thus relate the planets movements to the stars and parallel each star with a place on the map of Egypt and surroundings, and you have a good practical observation system. The Nile could well have been the ecliptic with the pharoahs moving up and nown the Nile and the ecliptic. Then one can look at the movements of Moses in this light and consider that some planetary interacion sent the Moon, or maybe some other body, on a trip off the ecliptic plane. I have been considering the Exodus the last couple of days and I'm thinking that just as there was actual pharoahs representing planets, perhaps there was an actual Moses representing the Moon, or maybe Mars. When reading the 40 days and 40 nights Moses was on the mountain one starts seeing a lock between the earth and this other planetary body. But it could be some symbolic numbering and it is extremely difficult and quite a headache to try to work out just what Exodus is all about, but something planetary at it's core for sure. Science has no idea about anything in the past. The pole of the Earth does a wobble now, but under planetary interaction this wobble could and probably did become extremely large, so that the pole would have traced out a very large circle in the sky and there would have been no pole star, but a pole circle. And if this circle was large enough then that would explain the Sun rising in the West in the northern latitudes. Such a large wobble would not last long and would itself cause catastrophic conditions on Earth. However it does suggest to me a movement from the ecliptic. Archaeologists working in Turkey have unearthed an Assyrian tablet dating to around 670 BCE that "could have served as a model for the biblical description of God's covenant with the Israelites." What this fascinating discovery suggests, of course, is that the Bible tale of a divine pact does not represent "history" or a "factual" event, but is instead a fictional rewrite, borrowing or plagiarism of this older Assyrian treaty. Over the centuries, many Bible critics, minimalists and mythicists have asserted that much of the Old Testament constitutes not factual history but a rehash of ancient myths and traditions dating to before the founding of the Jewish kingdom. This new find apparently adds more evidence to that theory, and it is quite refreshing that both the scholars and the media are spelling out clearly this possible "borrowing," without prejudice in favor of bibliolatry or upholding unprovable matters of faith. Ancient treaty resembles part of the Bible. "Canadian archeologists in Turkey have unearthed an ancient treaty that could have served as a model for the biblical description of God's covenant with the Israelites. The tablet, dating to about 670 BC, is a treaty between the powerful Assyrian king and his weaker vassal states, written in a highly formulaic language very similar in form and style to the story of Abraham's covenant with God in the Hebrew Bible, says University of Toronto archeologist Timothy Harrison. "Those documents...seem to reflect very closely the formulaic structure of these treaty documents," he told about 50 guests at the Ottawa residence of the Turkish ambassador, Rafet Akgunay. He was not necessarily saying the Hebrews copied the Assyrian text, substituting their own story about how God liberated them from slavery in Egypt on the condition that they worship only Him and follow His commandments. But it will be interesting for scholars to have this parallel document. The researchers hope to glean information about Assyria's imperial relations with the west during a critical period, the early 7th century BCE. It marked the rise of the Phrygians and other rival powers in highland Anatolia -- now modern-day Turkey -- along the northwestern frontier of the Assyrian empire, and coincided with the divided monarchy of Biblical Israel..."
Notable is the fact "it is widely accepted that the Hebrew Bible was being assembled around the same time as this treaty," i.e., during the 7th century BCE. The case for this "late" dating of the Old Testament's compilation - with a significant part of it also written later, after the Jews' "Babylonian Exile" (597-538 BCE) - has been made by Israeli archaeologists, including and especially Israel Finkelstein in The Bible Unearthed. Although the article states that the archaeologist Timothy Harrison "was not necessarily saying the Hebrews copied the Assyrian text, substituting their own story about how God liberated them from slavery in Egypt," it is nonetheless raising that very issue in a manner which breaks with the centuries-old tradition of bending all finds in the "Holy Land" and other places of biblical interest to fit the Bible, in attempts to prove the "Good Book" as "history." It is obvious that this sort of bibliolatry appeasement from the more scientific segment of society is losing ground precisely because of such discoveries - and the implication of this one is a doozy. No historical covenant with God? It needs to be emphasized that this intriguing development concerns not just any biblical event but the very covenant between God and the Israelites - here indicated as not something supernatural that actually occurred but, rather, as mere human propaganda based on older texts from other cultures. This discovery, therefore, would essentially negate the basic premise of the Old Testament: To wit, that the Hebrews, Israelites and Jews are the "chosen people" of the Lord of the universe. Needless to say, for those of us who have been stating as much for many years - and getting pilloried for our efforts - this archaeological find is very exciting, as it adds to the growing body of hard, scientific evidence that the Bible is not "God's Word" but a manmade cultural artifact designed for propagandistic purposes. Furthermore, as the Old Testament is thus apparently in significant part a rehash and rewriting of the traditions and myths of other cultures, so does the New Testament story of Jesus Christ represent a remake of the mythical motifs of pre-Christian cultures, combined with OT scriptures serving as "blueprints" for the gospel tale's creation. "The tablet is quite spectacular. It records a treaty -- or covenant -- between Esarhaddon, King of the Assyrian Empire and a secondary ruler who acknowledged Assyrian power. The treaty was confirmed in 672 BCE at elaborate ceremonies held in the Assyrian royal city of Nimrud (ancient Kalhu). In the text, the ruler vows to recognize the authority of Esarhaddon's successor, his son Ashurbanipal," said Timothy Harrison, professor of near eastern archaeology in the Department of Near & Middle Eastern Civilizations and director of U of T's Tayinat Archaeological Project (TAP). "The treaties were designed to secure Ashurbanipal's accession to the throne and avoid the political crisis that transpired at the start of his father's reign. Esarhaddon came to power when his brothers assassinated their father, Sennacherib." The 43 by 28 centimetre tablet -- known as the Vassal Treaties of Esarhaddon -- contains about 650 lines and is in a very fragile state. "It will take months of further work before the document will be fully legible," added Harrison. "These tablets are like a very complex puzzle, involving hundreds of pieces, some missing. It is not just a matter of pulling the tablet out, sitting down and reading. We expect to learn much more as we restore and analyze the document." The researchers hope to glean information about Assyria's imperial relations with the west during a critical period, the early 7th century BCE. It marked the rise of the Phrygians and other rival powers in highland Anatolia -- now modern-day Turkey -- along the northwestern frontier of the Assyrian empire, and coincided with the divided monarchy of Biblical Israel, as well as an era of increased contact between the Levantine peoples of the Eastern Mediterranean and Egypt, as well as the Greeks of the Aegean world. The cache of tablets -- which date back to the Iron Age -- were unearthed in August 2009 during excavations at the site of an ancient temple at Tell Tayinat, located in southeastern Turkey. A wealth of religious paraphernalia -- including gold, bronze and iron implements, libation vessels and ornately decorated ritual objects -- was also uncovered. the bible seems to repeat important information and at the start of revelations the number 7 is mentioned a lot of times in this chapter. 7 churches, 7 spirits, 7 golden candlesticks/lampstands, 7 stars. why 7? are they different things or one thing that is being referenced? was "7" of something seen in the skies before the last catastrophe that struck the earth? then the duality of god/jesus is mentioned a couple of times - alpha/omega - first/last - was/is. is this in reference to the positive/negative - male/female forces that seems to be part of the natural power of the electric universe? is one of the most important parts of the opening section of this chapter the "and which is to come"? does this show the revelations is about what was (what has happened) and what will happen again. EU catastrophe events have occured and were remembered by ancient man. we remembered them until recently but now our science in the west is trying to eradicate silly "non empirical" ideas... myths. how did catastrophes start before or what are the possible signs it may be about to come? Revelation 1:7 Lo, he doth come with the clouds, and see him shall every eye, even those who did pierce him, and wail because of him shall all the tribes of the land. Yes! Amen! A Birkeland current occurs in pairs and each of these pairs can split into two current, making a 4-fold division. However the next stable configuration is a 7-fold division of the current, and thus the 7 golden candlesticks can readily be explained by this. Also if the current was coming directly towards Earth then 7 stars or maybe 7 spirits would have been seen. This is besides the symbolic use of numbers in the bible. 12 When I turned to see who was speaking to me, I saw seven gold lampstands. 13 There with the lampstands was someone who seemed to be the Son of Man. He was wearing a robe that reached down to his feet, and a gold cloth was wrapped around his chest. 14 His head and his hair were white as wool or snow, and his eyes looked like flames of fire. 15 His feet were glowing like bronze being heated in a furnace, and his voice sounded like the roar of a waterfall. the first thing i notice about these passages is that it does seem to suggest that it is not the voice of god/christ or god/christ speaking directly as such but it is the sound of god/christ, through the events happening. which there is no problem with unless you take the bible to be literal and can not distinguish between god speaking through events/happenings and god speaking directly to the revelator. but what is being described? my immediate thoughts go to the discussion on the GKS striped see through dresses and the pyramid skirts worn by the pharaohs. is it describing the same or a similar event? the son of human (the son of god) girdle?